The task group: "Protocols on The Radiation Safety Survey of Diagnostic Radiological Equipment" was formed by the Diagnostic X-ray Imaging Committee to provide a unified approach to radiation surveys of x-ray imaging equipment conducted by radiologic physicists. Stationary and mobile radiographic, fluoroscopic, dental x-ray, and mammographic equipment are covered. Due to its specialized requirements computed tomography (CT) equipment is not. The protocols described are intended to verify compliance with the radiation safety regulations outlined in the Code of Federal Regulations and the majority of state agencies. State regulations are not uniform from state to state, and federal are revised periodically. regulations Therefore, it is recommended that the appropriate state and federal radiation control regulations be reviewed prior to conducting surveys. Also, in view of the complexity and cost equipment, advice should be solicited of x-ray and/or the operator's manual referred to when the surveyor is not familiar with a given type of equipment. 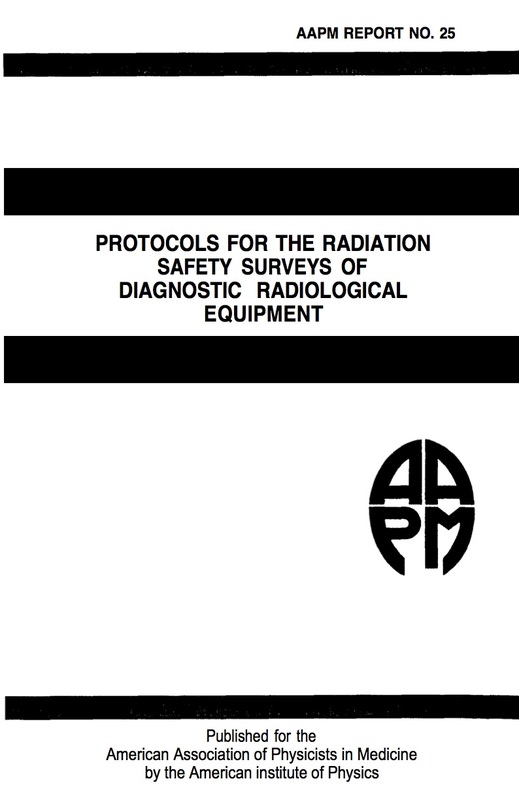 The objective of the report is to achieve a unified approach to routine equipment and was radiation surveys of x-ray imaging reflected in the task membership, which included: group's (a) Representatives from regulatory agencies, (b) Medical (diagnostic radiologic) physicists, and (c) Medical health physicists. The CRCPD (Conference of Radiation Control Directors, Program Inc.) has published radiation survey protocols for use by state-employed inspectors which may be useful in certain situations.